I use a Lookup function in my script, but when it fails (so it does not find a value) the entire process stops. To try and prevent this, I though of using a SQL function that does a count of the number of items that woudl match the lookup, based on the same input value on the record. I then send that to a IF / THen ELsE and filter if the value = 0, thus, if no value will be found, teh record should be ignored. Everything seems ok, but when I run the script, I get a "The adapter does not support the Execute function - and it then shows the SQL with a parameter replaced? I also include my script, but modified it to remove the MySQL password - but I can not provide valid test data since its contains cleint info, but I am sure you will be able to figure out what I am after. 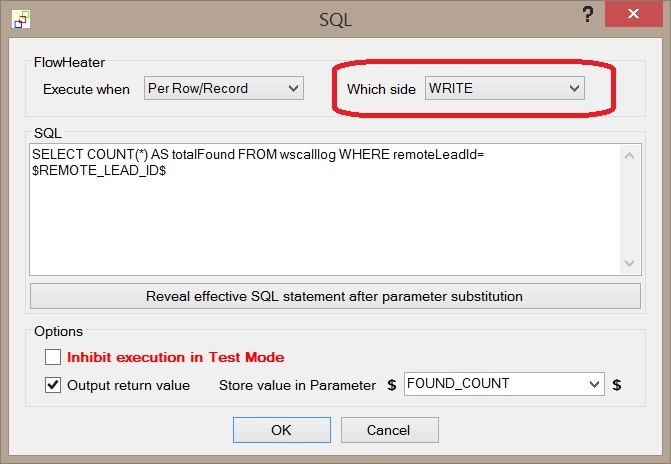 The solution for your inquiry is quite easy, you just have to switch in the SQL Heater the side where the SQL statement should be executed. The Excel Adapter currently doesn’t support the Data Lookup functionality. But it should be a easier way to use just one SQL Heater instead of the Lookup Heater . Note: The Lookup Heater is outdated because the SQL Heater is more flexible. I’ve modified our FlowHeater Definition. I’ll think it should be clear how it works.